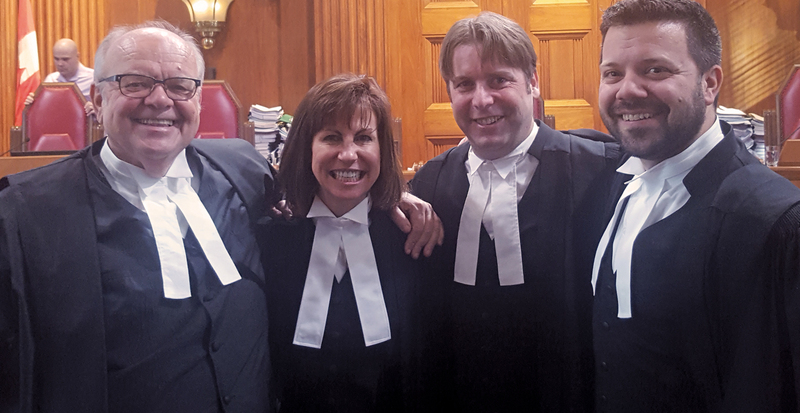 A couple of weeks ago, the Supreme Court of Canada heard an appeal with a long history that raised important freedom of association issues. This was the latest case exploring the scope of the recently recognized constitutional right to collective bargaining. The case involved a decision by the B.C. Liberals way back in 2002 to strip provisions from a collective agreement with the B.C. Teachers Federation and prohibited collective bargaining over a variety of matters in the future. A lower court judge ruled that the governments’ actions amounted to substantial interference in fundamental collective bargaining rights, but a majority of the B.C. Court of Appeal later overturned that decision. The following Guest Blog was prepared by the BCTF’s General Legal Counsel, Diane MacDonald. Years ago, Diane and I worked together at Victory Square Law Office, the firm that assisted Diane in the representation of the BCTF before the Supreme Court a couple of weeks’ ago. In a surprise (and stunningly brief) oral ruling from the Bench, the Supreme Court found in the Union’s favour, saying that it “substantially” agreed with the reasons of Justice Donald, who penned the dissent in the B.C. Court of Appeal. You can watch the full hearing and the Court’s ruling in the video here. The majority of the Court would allow the appeal, substantially for the reasons of Justice Donald. Justices Côté and Brown would dissent and dismiss the appeal, substantially for the reasons of the majority in the Court of Appeal. The Supreme Court of Canada reversed the BC Court of Appeal and made the minority the majority decision of the highest Court. To understand the judgment, we need to look at the reasons of Justice Donald in dissent at the BC Court of Appeal. By way of background, in British Columbia Teachers’ Federation v. British Columbia, 2011 BCSC 469, Justice Susan Griffin (the “trial judge”) found a breach of s. 2(d) after the BC Government enacted legislation in 2002 which stripped hundreds of provisions from the collective agreement addressing class size, resources for special needs students, student-teacher ratios and similar workload provisions. It also prohibited collective bargaining on those topics in the future. Following the 2007 B.C. Health Services decision from the Supreme Court of Canada, the trial judge found that this was a substantial interference with collective bargaining that was not saved by s. 1 of the Charter (the provision that allows governments to justify their legislation if it is reasonable in a free and democratic society). Also following Health Services, the trial judge stated that all this was done without even consulting with the teachers whose rights were infringed. The trial judge stayed implementation of her decision for 12 months to allow the Government to address the repercussions of its constitutional violations. Instead of appealing the decision, the BC Government interpreted the decision to say that its only mistake was procedural, i.e., it did not consult with the teachers before passing the 2002 legislation. So in 2011 the Government engaged teachers in consultations. However, these consultations were unsuccessful in addressing the issues arising from the 2011 decision. The Government then passed almost identical legislation to that enacted in 2002. The difference between the two pieces of legislation was that the 2012 legislation restored the ability to collectively bargain about the class size and related topics in the future, but not until the next round of bargaining. However, after more than an 11-year prohibition on bargaining, the teachers would have to negotiate from scratch because all the language was again removed from the collective agreement. The teachers again challenged the legislation. In British Columbia Teachers’ Federation v. British Columbia, 2014 BCSC 121, Justice Griffin found the 2012 legislation, which was largely the same as the legislation previously held to be unconstitutional, to also be contrary to s. 2(d) of the Charter and not saved by s. 1. This time the Government appealed. The 2014 decision was overturned by the BC Court of Appeal in British Columbia Teachers’ Federation v. British Columbia, 2015 BCCA 184. The majority of the Court of Appeal found no violation of s. 2(d), primarily because the government engaged in pre-legislative consultations prior to passing the legislation. In other words, the majority held that as long as Government talks to the union first it could pass what would otherwise be unconstitutional legislation. The Supreme Court of Canada has rejected this reasoning by adopting the decision of the dissenting judge at the BC Court of Appeal. The dissenting judge, likewise, largely adopted the reasoning of the trial judge. Of great concern is the notion that government can unilaterally delete provisions in a collective agreement, or temporarily prohibit collective bargaining, and “cure” such unconstitutional behaviour through the notion of “consultation” (298). Justice Donald did find that pre-legislative consultations are a relevant factor at the s 2(d) infringement stage, instead of under s. 1 as argued by the teachers. This is important because if consultations are considered under s. 2(d) it places the burden to establish a breach on the rights holder, the teachers. However, if it is considered under s. 1 the burden is on the Government to justify its legislation as reasonable in a free and democratic society. Although Justice Donald found that pre-legislative consultations are a relevant consideration at the s. 2(d) stage, he relied on different reasons than the majority of the Court of Appeal. He characterized the consultations in such a way that they look strikingly similar to collective bargaining. For example, he held that “at the centre of s. 2(d) is a Charter-protected balance between employees and employers that will allow for meaningful collective bargaining” (279). Justice Donald emphasized that consultations must give the union the “opportunity to meaningfully influence the changes made, on bargaining terms of approximate equality” (287). And citing Justice Abella from the Supreme Court of Canada he endorsed the well established labour relations principle that approximate equality is obtained by providing employees with their (now constitutionally protected) right to strike (291). Justice Donald implied that it is only when these essential elements are satisfied that consultations will be helpful to governments (287). If governments can rely on pre-legislative consultations, they must be conducted in good faith. An issue arose at the Court of Appeal as to the meaning of good faith in the constitutional context. Justice Donald cautioned that because governments might try to avoid rounds of bargaining by simply consulting with the union first, courts must undertake a probing inquiry into the existence, or lack, of good faith on the part of government. This was in contrast to the majority decision which criticized the trial judge for examining the substantive reasonableness of the positions and proposals of the parties during the consultations. Justice Donald warned that if the state can advance proposals as “final offers” and unilaterally “skip” rounds of bargaining through temporary prohibitions on bargaining “this would have the effect of making the act of associating essentially futile” (298). He stressed that “government always has the power to unilaterally resolve impasse through legislation” and that this “is a huge power imbalance that fundamentally alters the calculus of how negotiations unfold” (339). To prohibit such abuses of power by government, courts must undertake a probing and robust review of government conduct (292). All this is to say that Justice Donald held that the trial judge had not made a legal error by looking at the substantive reasonableness of the proposals and positions of government. The test from Health Services, Fraser and Royal Oak Mines, all cases from the Supreme Court of Canada, is that parties must “honestly strive to find a middle ground”, their positions cannot be “inflexible and intransigent”, and the negotiations must be “meaningful” (334). As Justice Donald remarked, if courts were unable to inquire into the substantive reasonableness of governments’ positions, as the majority held, governments would have a free hand, making “a mockery of the concept of collective bargaining” (340). If a court were barred from examining the substantive position of the government, this could create a constitutional loophole: legislation deleting important work terms that would otherwise fail the s.1 Charter analysis, because the deletion has no rational connection to the stated policy goals of the government, would sometimes not even reach the s.1 stage because the court was barred from probing the substantive position of the government and therefore took the government at its word that no alternative was possible (347). Justice Donald ruled that the factual findings of the trial judge deserved deference because she was in the best position to assess the extensive evidence before her. She had presided over a 29 day trial and was the proper adjudicator to weigh the testimony and other evidence. As Justice Donald remarked: “An appeal is not an opportunity for a de novo hearing or an attempt to roll the dice again with potentially more sympathetic judges” (325). According to Justice Donald, applying an appropriately deferential approach to the trial judge’s findings of fact “inexorably leads to the conclusion” that the finding that the 2012 legislation was unconstitutional was correct (276). There were no palpable and overriding errors (the legal test to overturn a trial judge’s findings) in the trial judge’s assessment of the evidence, her findings of fact and the inferences she drew from those facts. 4. Were the Consultations in Good Faith? The trial judge found that the Government had negotiated in bad faith by: 1) basing its position on false assumptions; and 2) refusing to consider the union’s position, the “closed mind” finding. Justice Donald agreed. In terms of the false assumption, the trial judge found in the first decision that the Government’s need for flexibility was based on unsubstantiated hearsay and myth and concluded that the collective agreement terms incorporated the flexibility sought by the Government (355). Despite this finding, throughout the consultations the Government continued to assert that it needed flexibility. Relying on the trial judge, Justice Donald found that the Government’s unwavering position was that the collective agreement terms could not provide that flexibility (354). In terms of the closed mind, Justice Donald agreed with the trial judge stating that, any “disagreement or negotiation on the part of the union was futile; the die was cast” (351). This was made manifestly clear by the fact that the Government’s representatives had not even read the collective agreement language until 5 months into the discussions. This was despite taking the unwavering position that they were so inflexible the Government could not consider either restoring the collective agreement terms or allowing teachers to bargain those issues in the future. Justice Donald agreed with the trial judge that this was cogent evidence of bad faith (360-62). The purpose of the legislation was pressing and substantial and there was a rational connection to the means chosen. However, the legislation was not minimally impairing. The temporary prohibition on collective bargaining, upon which the Government relied, was not a mitigating factor but rather “exacerbated the effect of all the previous unconstitutional actions of the Province” (384). Justice Donald found that removing collective bargaining rights again, after the teachers has spend so much effort to regain them, “would have caused even the most heartened observer to see the union’s associational activities as something akin to a Sisyphean effort” (384). In addition to a declaration that the legislation was of no force or effect, Justice Donald held that an additional constitutional remedy was required. Consequently, he provided a s. 24(1) Charter remedy that the Minister of Education direct the bargaining agent for the employer to reinstate the terms back into the collective agreement immediately. Based on this decision governments should be wary of trying to rely on pre-legislative consultations to justify government legislation that interferes with collective bargaining. However, we can expect more litigation regarding pre-legislative consultations in the future as other governments have relied on this factor to justify intrusive legislation. I am curious – I just read a news article that the Nova Scotia government is about to impose a “contract” on teachers. They have put very strict limits on both the range of collective bargaining and on arbitration, according to the article. Given the recent decisions in both BC an Ontario, why would the Nova Scotia government feel this was a workable approach? Could it be that, even when the laws are eventually declared unconstitutional (if the union in question can afford the protracted court battle), the current government gains what it wants and a future government gets to deal with the consequences? If this is the case, can and or should the Supreme Court consider and try to remediate this sort of political maneuvering (if that’s what it is). I’m not a lawyer or a law student, I’m just curious. Thanks!